YEP! Celebrities Breastfeed Too! In fact, some of them on the list might just surprise you! If you know of a celebrity mom who breastfed that is not on my list, please email it to me! Adrianne Barbeaux, actress, over 50 and nursing TWINS! and said "I feel that is why he is the athlete he is." Soccer Mega Star Pele's mom breastfed him for 5 YEARS! It is known thet Brittney Spears breastfed for a short time with each of her children. Gabrielle Reece, superstar volleyball player, breastfed both of her children. Elisabeth Hasselbeck, Co-Host of The View, breastfed all her children for a time. It should be known she also does ads for a cormula company, which is unfortunate. Christina Aguilera, has stated recently that her plan is to nurse at least 2 years! Angelie Jolie, has been very public with her plan to breastfeed her upcoming twins! Jamie Lynn Spears. Teen mom, had her baby at just 16 years of age. ...................and many more mothers that I have missed!!! Singer-songwriter Tori Amos shocked her fans this fall when she announced the birth of her baby girl. Word of her pregnancy was kept hush-hush, while Amos was quick to remark on the first time she nursed her daughter. "An ounce of breastmilk is even more potent than the finest tequila." Singer and actress Erykah Badu, who is getting ready to release her latest album since her critically acclaimed 1997 debut Baduizm, recently talked to Launch.com reporter Lucy Tauss about becoming a mother in the last few years. ""When I first had the baby, I was breastfeeding for two years straight, so we were together for two years of his life - every day, all hours of the day. So I was two people, and I eventually morphed back into one. Now he's part of me. He's very independent as a result of it. I thought it was going to be the opposite," she added. "I was very worried that he was going to be attached since we were together every day, but I guess it made him feel comfortable: 'I know she's around. She'll be there.' It made me feel like a very responsible person and tidy, and my health was better because I'm now responsible for someone's whole reason for being." I think she's such a great advocate for breastfeeding as she makes it seem such a natural part of parenting and life. Regis was holding up pictures of her son and she said, "I'm nursing him, so you'd better put those away or there'll be a problem here." Then she said, "All you women, you understand." You saw the Jodie Foster film "Anna and the King" and you thought Jodie has dieted her way down to pre-pregnancy weight? Well, according to an article in the New York Daily News, Jodie has slimmed down after the birth of her son in September 1998 by breastfeeding. "I just couldn't stop losing weight with the breastfeeding," Jodie said in the Daily News article. "I ate as much as I possibly could, but I kept losing. You'll see why when you meet Charlie. He's a stocky guy, and he likes to eat and eat more. You cook it, he'll eat it." . . . .
OK, so she's not a supermodel or a Hollywood actress, but Arcelia Garcia made headlines when the grandmother of 13 gave birth to healthy triplet girls on Jan. 8. At 54, Garcia is three years older than the average age of menopause. For that reason, some doctors feared the babies would be born with chromosomal problems, but the babies and mom were doing fine just days after the birth. The Jan. 24 issue of People magazine reported that Garcia planned on breastfeeding all three babies. "They're healthier that way," she told People magazine. The October issue of Vanity Fair featured a picture of model and actress Jerry Hall breastfeeding her and Mick Jagger's son, Gabriel. The picture was taken by celebrity photographer Annie Leibovitz and is featured in Leibovitz's latest book entitled "Women." In the photo, Jerry is elegantly dressed (heels and everything) sitting in a chair, breastfeeding her son. Some of our members posted their thoughts about the picture on our message boards. "It's like she is saying, look at me breastfeeding and how glamorous it can be too, and she's not too worried about an "accident" on her designer outfit!," wrote one member. Country Music Network recently aired a biography of singer Faith Hill (who is married to country star Tim McGraw). One of our members reports that in the program, Faith talked about how she would take breaks from shooting her latest music video to breastfeed her daughter. "I think that's wonderful, and I'm glad to hear that she said that, so that some of her fans might be encouraged to do the same," one of members posted on the message boards. People magazine from the week of November 25 featured an article on supermodel Elle McPherson. In the article, Elle is identified as a nursing mom. She breastfeeds her son, Flynn. Vice President Al Gore's oldest daughter Karenna is a breastfeeding mom to six-month-old son Wyatt Gore Schiff. The New York Observer published an article about Karenna earlier in 1999. The article said, "...Ms. Schiff's life has been one long scheduling crisis, between classes as a third-year Columbia law student, breastfeeding little Wyatt and getting on the horn with Gore campaign consultant Bob Squier. Karenna has been helping out with her father's 2000 presidential campaign. The New York Observer article also mentioned how in the early 1980's, Al Gore attacked Nestle for marketing its infant formula to Third World countries. At the same time, Tipper Gore banned all Nestle products from the Gore household. Karenna recently told ThatGlow.com her thoughts on breastfeeding. "I am totally supportive of nursing in public. I feel like if your baby is hungry and screaming, you gotta do what you gotta do. I can remember one time I was nursing in Central Park and I was fantasizing that I would get arrested and be thrown in jail for nursing. I imagined that I would then lead a massive picket line of nursing mothers. I get that from my Mom - she nursed us and is very certain and strong about doing things in a natural way. I think that we have to do a lot more as a society to accommodate working mothers. Breast feeding in itself is a real challenge. I had this vision of breast feeding lounges or something. I’ve found that since I’ve had my baby I find that other mothers are the most helpful." Proud Celebrity Moms Breastfeed Publicly! 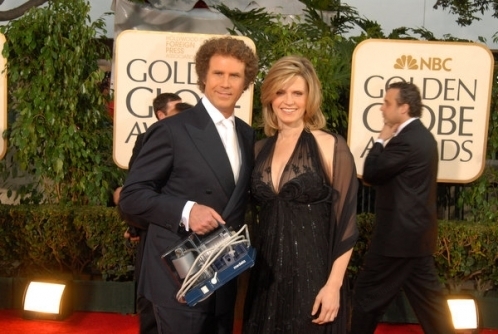 WIL FERRELL AND HIS WIFE, BREASTPUMP IN TOW! LUCY LAWLESS aka XENA, THE WARRIOR PRINCESS! JULIA ROBERTS, TWINS AND THE NEW BABY! ALL NURSED! Southern NV Breastfeeding Services THANKS CELEBRITY BABY BLOG, PEOPLE MAGAZINE, OK! MAGAZINE AND MORE FOR THE WONDERFUL COVERAGE OF BREASTFEEDING CELEBRITIES THEY PROVIDE!